Q: I work in the Air Force and have a requirement to digitally sign .pdf forms with my Common Access Card (CAC -> militaryID). 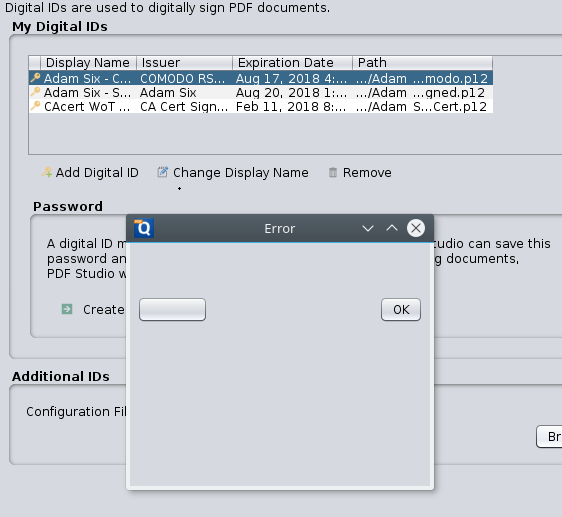 Does the digital signing capabilities of your software PDF Studio interact with linux’s libcackey or your own libraries to enable digital signing of documents? Will my CAC work with your software? A: We think you should be able to use the PKCS#11 interface for the CAC in order to sign PDFs with PDF Studio on Linux. Once there, look at the PKCS#11 section: apparently, there is a module called “CACkey” that you should be able to download from software.forge.mil. We’re unable to do this because it seems that you need CAC authentication to get access to that website. How to setup USB Smart Card Hardware PKCS11 signing on Linux with PDF Studio. Since we are unable to try this ourselves, please send us feedback by emailing us that we can share with other CAC users. “Error saving document: sun.security.pkcs11.wrapper.PKCS11Exception: CKR_USER_NOT_LOGGED”. Do not sign with the digital ID with Certificate Issuer “DOD Email CA-31″, which is an email certificate. Use the signing certificate instead. Once I selected the signing certificate, I was able to save a signed PDF. Make sure to also restart your machine after installing opensc. 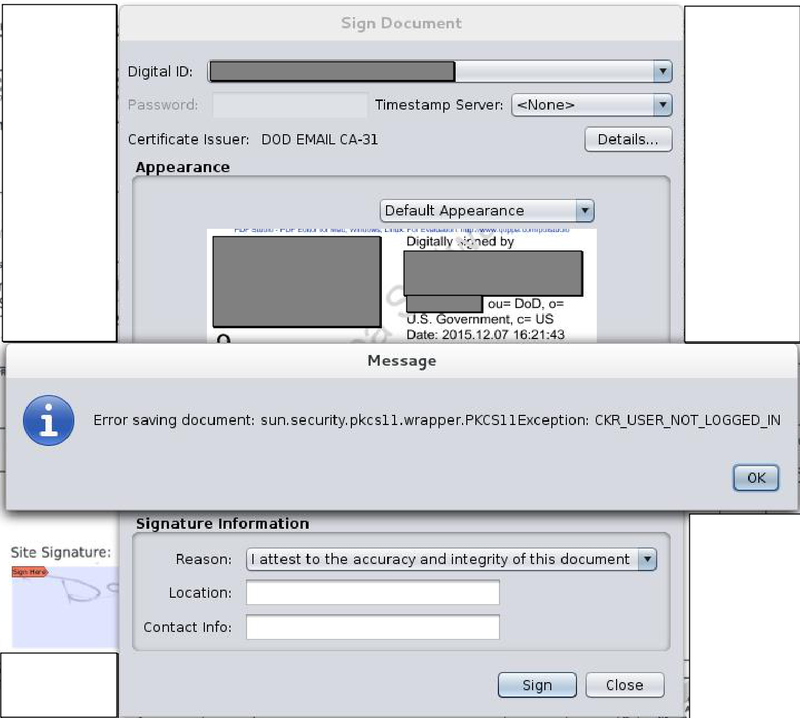 User 2: I have spent several hours now attempting to Digitally Sign a document with a Certificate on a Smart Card. The Smart Card is working via Firefox, but continually receive an error trying to work with PDF Studio. As shown via the attachment there is no clue provided as to what the issue may be. I have tried the config.cfg file many different ways. Ubuntu 16.04 LTS, DigiScan Card Reader, opensc, etc..